Final Fantasy XIV was released in September of 2010, and it wasn't very good. On August 27, nearly three years later, Final Fantasy XIV rises again a realm reborn, and Square Enix is celebrating with a collector's edition that's much better than the original. 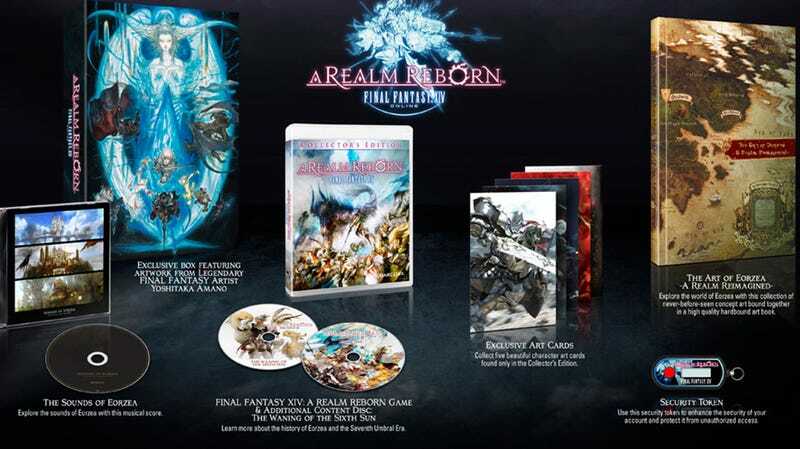 Now available for preorder for the PC and PlayStation 3, Final Fantasy XIV: A Realm Reborn features a new game engine, revamped mechanics and all sorts of tweaks designed to get rid of the bad taste left in the mouth of everyone that played the original disaster. The base game will be available for $39.99 on the PlayStation 3 and PC, while the extravagant collector's edition will run $79.99 and $69.99 respectively, though the PC collector's edition will be exclusive to Square Enix's online store. So what's in the big shiny box? I don't recall exactly what was in the original collector's edition, but I know it included 2010 Final Fantasy XIV, so this has to be better. Fans who roll the dice on a preorder will score early access, along with some digital goodness. You can find out more at the official site. Who's ready to give this another go? I'm scared, but oddly-excited.